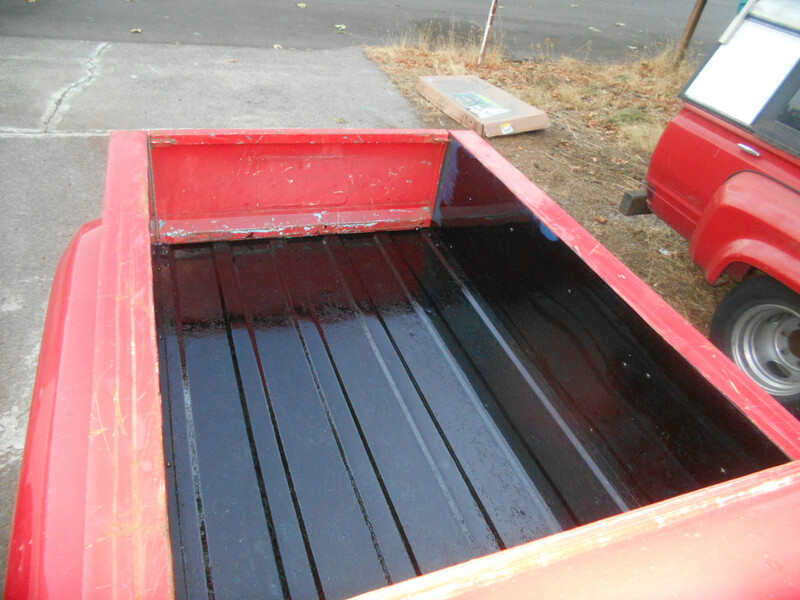 I worked on the box bed today for a little while, I pressure washed it out, then I scraped on it with a scraper for a while, then I blew it out with air, then I covered anything with rust with POR15 which was basically the whole bed floor and spots on the bed sides, if the weather holds I will likely paint it with Rust-oleum flat black(oil based), I have a small paint gun and a regulator. This is what I did for the fuel filler as the way it was didn't work very well. Well postimage still is not working, I will insert the photo when it starts working properly. The reason I went this way is because the tank is on the passenger side, yet the filler hole is on the driver side, when filling I had to barely pull the trigger and it took like 10 minutes to put 10 gallons in the tank as the gas had to go thru this long level tube all the way to the other side, it sucked having to stand there trickling the fuel in, this way it can take the fuel full blast. When my friend frame swapped his 521 to the 720 4x4 one, I really wanted him to run both tanks. Would have used a level sensors and a pump to have the 521 tank (bed mounted driver side) dump to the 720 tank (frame mounted passenger frame). And being that we had a body lift on it, gravity would have been on our side. I could never convince him to do it though. The gas they sell these days rusts out empty tanks, you absolutely do not want a tank to be unused/almost empty, my work trucks extra tank got wasted in no time because it had less than a gallon splashing around in the bottom, and when I put fresh fuel in it it ruined the fresh fuel. If the 521 tank was plastic there would not be an issue, but they are metal so fuel has to be cycled regularly, fact is I believe having an active return line is a good thing with this crap fuel, it keeps it mixed. 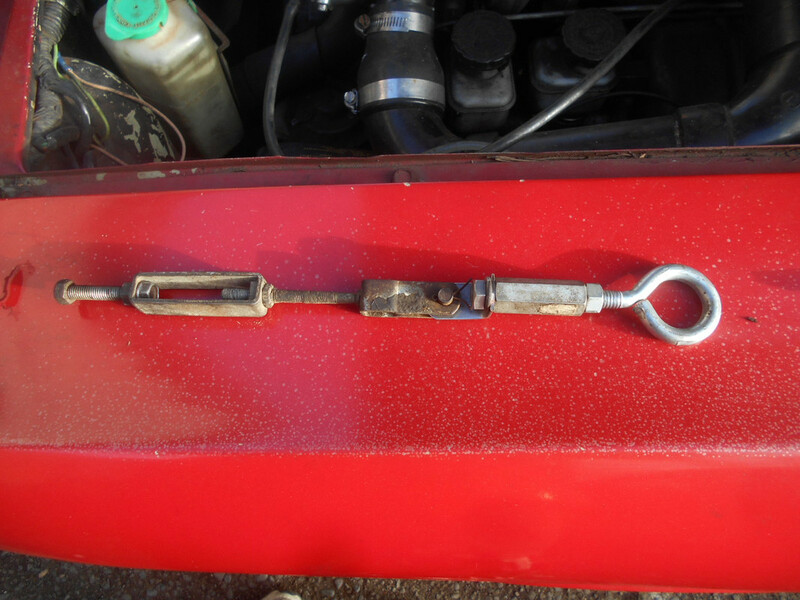 I am having an issue with this truck now, the upper starter mount bolt hole is stripped, it will not even hold a bolt now, the stater makes funny noises when I start it like it is skipping teeth, unfortunately I am going to have to drop the transmission to fix it. I am not looking forward to doing this, but this truck engine doesn't start well when it is cold, so I will drive the 520 for a while, it starts easy and runs good since I fixed the cam timing, although it is a lot noisier intake wise. 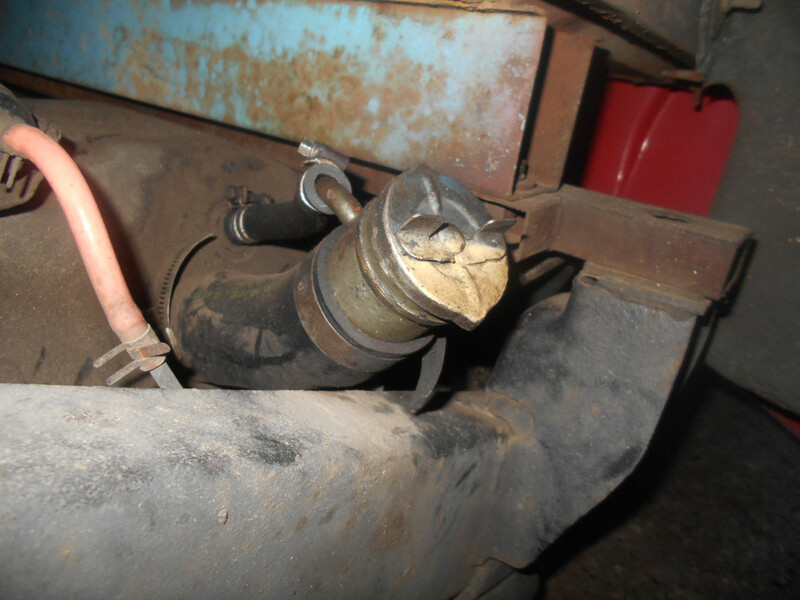 I was considering removing the starter and drilling the top hole all the way thru the transmission and putting a nut on the end sticking out while it is in the truck, but since installing the turbocharger there is no way to get the starter out of the way. DRIVEN wrote: Inner fender access cut-out? I thought about that, the front inside is cut up anyway making room for the 720 power steering gear, I seriously doubt if the starter will squeeze by the steering column, I will look when I get the time. It really don't fix the issue though, but if the starter was out of the way, maybe I could get a drill in there and drill the hole all the way thru the back side and put a lock nut on there and tighten it down. I didn't do anything today except work, by the time I got home it was raining and I was wet from pressure washing, so I took a shower, filled the wood stove and watched TV and typed responses on the forums, tomorrow it is also supposed to rain, I likely will not get much done then either. I can hardly believe how hot it is in this house and I don't feel hot, it was 89 in here earlier and I was not hot, it's 86 now and I feel just fine, I used to like it 70, now that feels cold. Man, I covet your wood heat. I got to thinking about the cutting of the inner fender on the driver side to access the starter, that side is cut up pretty bad now, I cut it to clear the upper control arm, I cut it to clear the power steering gear, when I put the turbocharger on it I had to cut it to clearance the power brake booster as I moved it sideways(it was on crooked anyway), I will likely look at it tomorrow, remove the tire/wheel, the thing is the only reason to cut it is to be able to maybe remove the starter, it really will not help me access the starter as I access the bottom mount bolt from the bottom, and the top has to be accessed from the front of the starter, the last time I tightened the top bolt I put a socket on an extension that was about the same length as the starter and I got it on the bolt(bolt was already in position), I then could see the end of the extension thru a small hole just under the turbocharger, I then put a wobbly on the end of a very long extension(3 foot long) and somehow got it connected to the end of the short extension on the mount bolt without knocking it off the mount bolt, I then connected a ratchet to the end of the long extension, then I grabbed the long extension as far down it as I could to stabilize it and I started to tighten the bolt, but it never got tight, it just turned and turned. 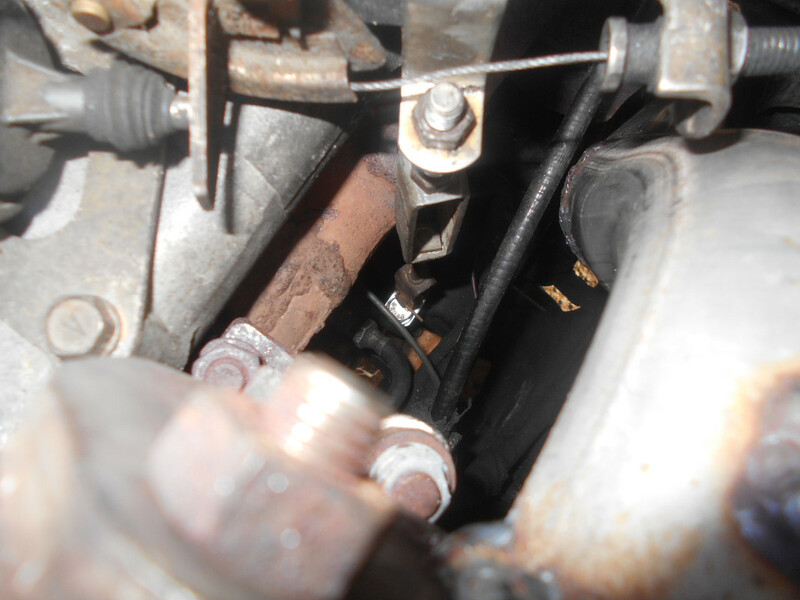 So to stabilize the starter I hammered a chunk of wood in between the end of the starter and the engine mount bracket connected to the engine, well the block is still there, but it is not doing a good job anymore and the top bolt on the starter is gone, it's likely stuck between the starter and the block. I first will look to see if there is actually enough room to slide the start out the side, the column is in the way, the exhaust down pipe is in the way, the oil line connection for the power brake vacuum pump and turbo feed is in the way, the frame is in the way, it might be easier to remove the torsion bar but that still will not give me access to the top mount bolt to just get it in the hole and started so that I can use my tightening technique. The only reason I want to get the starter out of there is to see if I can get a drill in there to drill the transmission case all the way thru so I can put a lock-nut on the back side, if the drill will not fit in there I will have to drop the transmission anyway, so what would be the point of doing all that other frustrating work, maybe I should just drop the transmission. It's almost like that engine was never intended to fit in as 521 . There are a lot of things this truck is that were never intended. Since it is sitting on a 720 frame the transmission cross member is removable so that alone makes dropping the transmission way easier. This transmission has always made front bearing noise since the day I started it, it might be a good time to look at that also. I don't know yet what I am going to do, I have other trucks to drive, and this one don't start near as easy when cold out as the others, but I think I should get this one fixed before I do the work truck conversion, as that will take a while and this one is in the way when it comes to dealing with what I have planned for that one. I looked at the inner fender and if it would be possible to remove the starter if it was not there, not a chance of that starter coming out that way, the column and exhaust pipe are in the way, along with a bunch of other stuff, I lifted the truck in the air and looked at removing the transmission, the exhaust pipe is going to be a challenge, but I think it will come out of there without cutting it, I have bucket seats so there's not a bench seat issue. 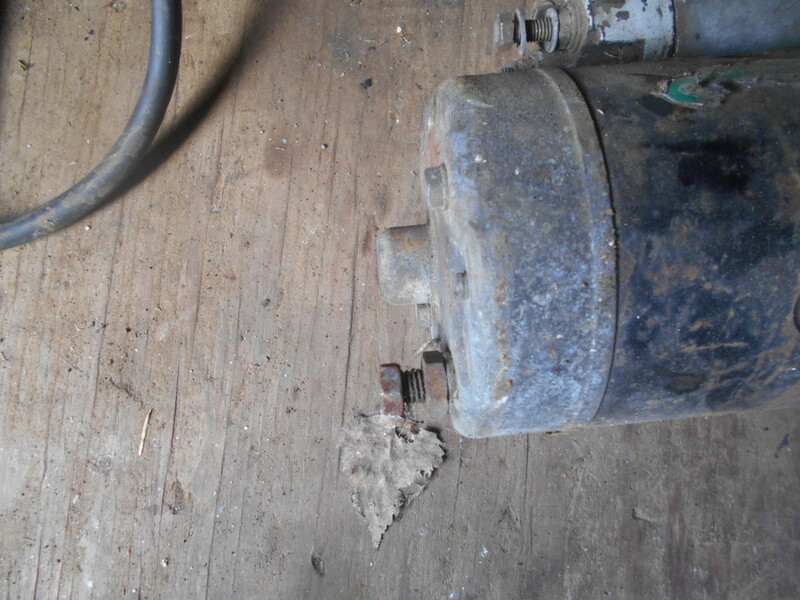 I am looking to buy a transmission jack, not sure which type yet, but I cannot lift the transmission up there anymore, so I need a transmission jack. 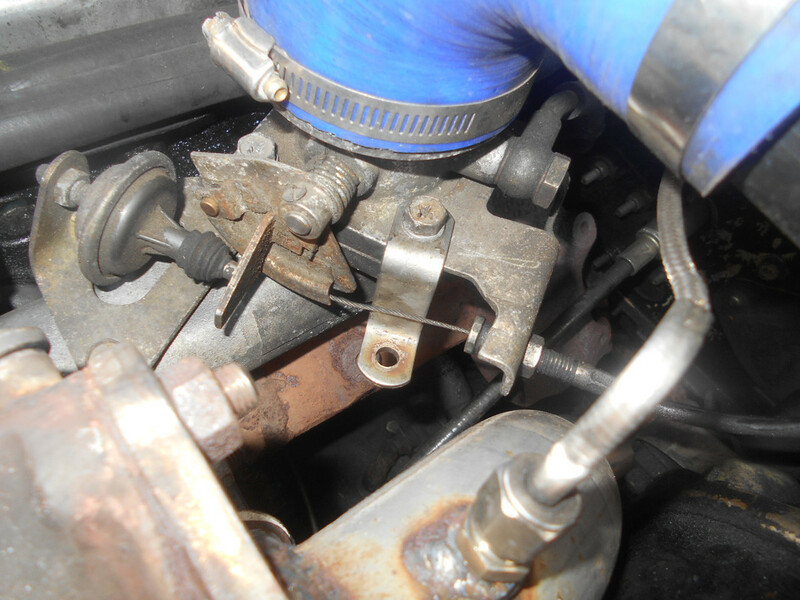 I am starting to think about other ways to fix this issue, if I put a strap around/over the exhaust manifold between number 3 and 4 outlets, put another strap around the end of the starter, then put a turn buckle between the straps and tighten it up I believe it might pull the starter up tight against the plate like the upper bolt was tightened, the bottom bolt was tight when I checked it, I believe this is something I can try tomorrow. OK, so you guys are not going to believe what I did to keep from having to remove that transmission, this is some backyard mechanic, on the road and i need to get home crap that most would say it will not work. So I made this, it took a few hours to figure it out and get it the proper length. I put the eye over this nub on the back of the starter. I made this connection that is bolted to one of the intake throttle body mount bolts. I then put it all in there and tightened the nut on the top, it's kinda hard to determine how much to tighten that nut. I have no idea if this will actually work as it is very hard to see down there to see if the starter lifted any when I tightened that nut at the top, I plugged the block warmer in as it is 35 degrees out there and that engine would be really tough to start, I will let it heat up and try it out, if it sounds good and don't make them weird sounds like it is skipping teeth I will call it good right now and get back to the work truck conversion. The thing is that the starter is actually being forced out when I turn the engine over and it sounds weird, if it sounds normal when I turn it over this time then I will be happy, as I then will believe that it is not being forced out/away from the flywheel. I will not be driving this truck anyway as it is very hard to start this time of year, it likely needs new glow plugs, but the last set I bought from Baxters blew up like balloons on the end of the glow plug and I was very lucky to get them out of the holes they thread into, I had to use vice grips to get them out after I ran out of threads. Well it has appeared to work, no weird sounds, it just turns over till it starts, it actually took 3 tries to get it running, but there were no weird popping noises like there were before, it sounds normal and there is no upper mount bolt in sight. For now I am going to use this fix, I had a block of wood in there before, I started to take it out but changed my mind, after the jury rig was installed I pounded the block of wood back in there and it sorts touches/holds the eye in position, I believe it will keep the eye from popping off the nub as that was one of my concerns. The block of wood doesn't actually block the eye from popping off, but it looks like it touches it enough to stop it from working its way off the end, if it does come off I will make another block of wood to hold the eye on the nub, I am hoping for luck here as that is all that I have on this fix, it is luck it even worked at all. 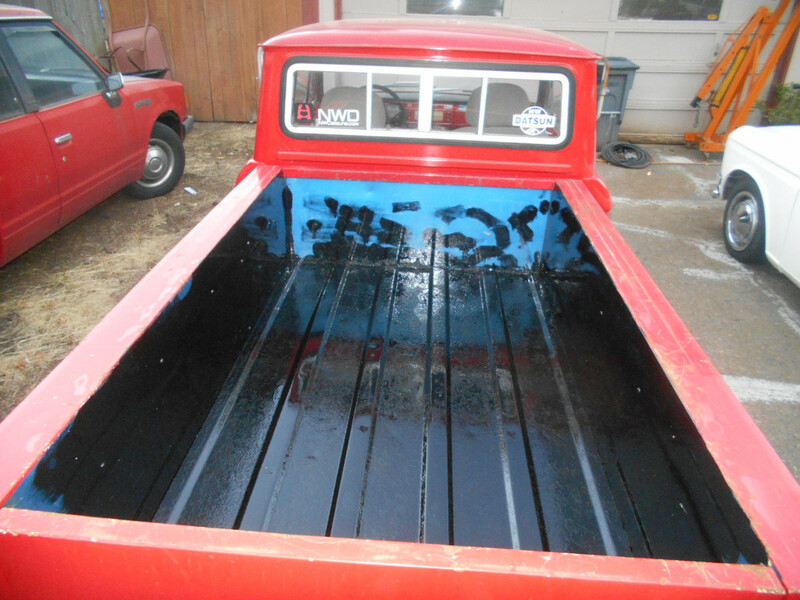 I had the truck painted again as the clear coat was pealing, they did too much sanding before the paint, it is not as smooth as it used to be, oh well it still looks better than it did. Well it appears I cannot add photos to my posts, I can attach them in the attachment box below, but the status box of the attachments do nothing, it just stays a gray color and the photos do not show in the reply, the photos are 819KB and 795KB, maybe it has something to do with the browser I am using, oh well, the truck does look better. Have to be in full editor, not the quick reply. It will start uploading. Too the right under "Status" there should be a loading bar, followed by a Green check mark once uploaded. My guess is the upload is taking too long for you.